Here's the paper by Arthur C. Nelson and Joanna Ganning, who are from the University of Utah. The study was published by by the National Institute for Transportation and Communities at Portland State University. BRT can be a powerful tool to help meet the demand with limited resources. More than 20 BRT systems are in the planning stages around the U.S. -- about the same number of systems that are currently operating. But to reap the benefits of BRT investment, Nelson says cities must ensure the systems are designed and operated at a high standard. Rebranding buses isn't enough. In addition to high frequencies, BRT routes that affect development have features like dedicated lanes, level boarding, off-board fare collection, and signal priority for buses at intersections, he said. + One of the interesting findings about BRT systems drawing jobs was that they appeared to exert the most pull on manufacturing jobs. Nelson and Ganning speculate on a few reasons that might be -- maybe the BRT systems allow a greater range of people better access to those places -- but admit they can't say for sure why that is. Oh, and among the types of manufacturing that showed up in some of the cities studies: craft brewing -- which is interesting given the growing craft beverages corridor between Albany and Troy, which is one of the corridors targeted for a new BusPlus line. + "Transit-oriented development" is one of the things that supposed to be folded into the Rezone Albany project. And based on this study, it appears BRT can influence development. So it'll be interesting to see how that project and BusPlus do/don't end working in parallel. Related: Is there a way to help encourage the generation/retention of mixed-income development/jobs along these corridors? + That comment by Nelson in the Streetsblog post highlights one of the challenges for CDTA with BusPlus: Scraping together the funding to get the new BusPlus lines is one thing. But the biggest bang for the investment is probably going to come by building out a real, robust BRT system. It's not enough to just have buses with different paint schemes -- there's gotta be a clearly higher level of service. Part of the recipe needs to be rezoning within walking distance of the stops. The Village of Colonie has a perfect site for mixed use development where the K-Mart used to be, across the street from a BusPlus stations at Central and New Karner. They've approved a used car lot on that site. We need bus lanes. Especially on Western/Washington Avenue. It is great that they refurbished the sidewalks on Western by the UAlbany campus, but bus lanes would be more efficient. I can't tell you how many times I get caught behind the CDTA or UAlbany shuttle. HOV lanes would be another great idea. A new road or light has to be built. I do not know when the last time a new road was built, but I am assuming more then 50 years ago. Paul, there's no room for bus lanes. 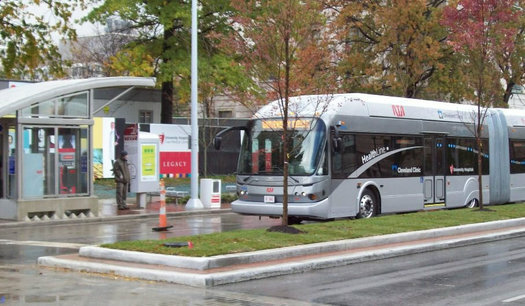 There is, however, a dedicated busway planned for the Harriman campus and UAlbany. That aside, I've been impressed with the Red Line, though Z makes an excellent point about development in Colonie. Given that suburbs are generally more interested in cars than people, I don't expect this to change, but fortunately, the next two corridors are much better positioned for this sort of development. In 20-30 years, I'd be fine with the push for light rail. Until then, it would be helpful if people would stop wasting their energy. We're a collection of small cities in a small area. Light rail would be an unfathomable waste here. We're actually a sorta big collection of small cities. As a whole, the Albany-Schenectady-Troy metro area is 61st in the country, with a little under 0.9 million souls. Now, if we weren't Balkanized into some three score separate fiefdoms, er, municipalities, we could really do something! Sure, cost is a prohibitive factor in light rail development here. But so too is lack of density. Where do people work? Where do they live? What are the land use patterns in the suburban residential and commercial areas of the region? Simply put, the cities are not dense enough and land use isn't supportive of a light rail system that would operate efficiently or economically. I don't mean to over simplify it, but capital costs are "easy" - there are big ticket state and federal programs, like TIGER, that fund the development of light rail. But operations are another story. Grants and financing don't typically fund operations. When the demand of existing service outweighs capacity, then light rail will become more feasible. The proposed siting of a single, consolidated bus stop on Washington ave sparked an embarrassing, enormous debate about balancing transportation needs and quality of life issues. I can't fathom that citizenry who can't come to terms over a small improvement in transit service for a sizable benefit to users, could possibly back light rail which would have a much more significant impact. We can't get out of our own way. For now, gas is cheap, no one wants to address the crumbling infrastructure, and no one wants to touch the live wire - the gas tax hasn't kept up with inflation in more than two decades while increasing MPG rates mean the value of the gas tax is shrinking each and every year. Congress won't even put a transportation bill out that will last more than two years. Forrest - light rail construction cost is about $50-100 million per mile by now. Half a billion would buy a line from downtown to Colonie center. And the same question which is asked for any major construction - what should we demolish to make room for that? Paul - and same demolition question goes for any new road. People in affected neighborhoods don't like those, home values drop, plenty of imminent domain payments - and nobody is happy with that anyway.. I will commend CDTA for making great strides to improve efficiency and access, with the Red Line BusPlus being its marquee service. For me personally, the access to real time bus arrival information has been my personal favorite new perk launched by CDTA. In the past 4 years of using CDTAâ€™s service, Iâ€™ve noticed consistent strides forward; somedays, when Iâ€™m rushing for the bus, I almost miss the days when it was late giving me extra time to make it. With that said, the bus rapid transit blend that CDTA has pushed with the Red Line (and appears similar for the proposed Purple and Blue) is rapid transit light, but given the entrenched suburban interests to put cars before all else, and cash strap cities like Albany and Schenectady unable to pay for the appropriate infrastructure upgrades that would allow for a true â€œrapidâ€ experience, things are what they are. Fortunately, the successes of these efforts have resulted in explosive growth in transit use in the past 5 years (36% increase in ridership) and CDTA will soon be pushing out its â€œNavigatorâ€ pass system which should speed things up quicker when it comes to paying on-site. Another positive thing I see is the city of Albanyâ€™s rezoning effort to capitalize on the BusPlus shelters, as well as, other frequently used shelter locations, which the suburbs donâ€™t seem to be getting. This will work in the cityâ€™s favor as millennials (and downgrading empty nesters) increasingly put root in walkable areas, that offer a lot of variety and good transit options to get there. These will serve as excellent touch points for businesses to build out from. The warehouse district, from my anecdotally perspective, was once a fly by for those who used the #22 bus, but as more and more businesses open up, Iâ€™ve seen far more folks joining me for the bus ride to get to the warehouse district. In this example, you can also see how a growing business climate fed increased transit use, which feeds back into the business community in this corner of the city, resulting in a beautiful positive trend forward. Hereâ€™s to more and more of these developments moving forward. Z. - even without balkanization... think about high school vote in Albany - there are no formal divisions within the city, but results greatly varied across single municipality. Things would only be worse within bigger crowd. Thanks, Mr. Daley. I was referring to Western Avenue itself, and the complaint about being "stuck behind buses." The bus-only lanes through the campuses we both mentioned are very welcome inclusions. Zed, good point, and I agree. Speaking to Mike's response, there certainly is a variety of voting habits and preferences within even Albany, that's true. But with no regional cooperation at all, real improvements are difficult if not impossible. I think digging deeper into rapid bus transit is the region's best option and there is a ton that can still be done. But even there, as pointed out, we had the embarrassing situation of "urbanites" (led by the antagonistic owner of Iron Gate Cafe) bad mouthing bus users to defend their narrow-minded views over the re-engineering of the transit and pedestrian infrastructure at Lark and Washington; an investment that would have vastly improved pedestrian safety and streamline multi-modal use by buses, cars, hell, even those who wished to commute this stretch by horse back. I think light rail is a pipe dream at this point, however, with that said, I think the best way to remotely see if it could work would be to pilot the concept by utilizing the rail infrastructure current used by Amtrak/CSX between Schenectady and Albany (um, hm Rensselaer) train stations. Restore the former rail station downtown in Albany, run something between Schenectady, Albany and Rensselaer, using CDTA buses as transit connectors to points beyond the stations, and see who nibbles. Otherwise, I just don't see it happening based on the conversations I've had with coworkers, especially who live North of Mohawk River, who dream of the idea of taking light rail to work, but quickly dismiss it when they realize that their communities aren't designed to allow them to pop off at the shopping mall or grocery, thus relegating them back to their cars. Bill - I would say a very reasonable idea (just add some stops in between, e.g. Fuller-Washington-Railroad corner, for example). Bit if you ever had a chance to ride Amtrak, especially towards Buffalo, you would be a bit more skeptical. Mike, with the very recent addition of a second track between Albany and Schenectady (and possibly Saratoga? ), that seems a potentially out-of-date criticism of Amtrak's service. And for whatever reason, every time the train to Boston is late, which is to say every time I take it, the problem seems to have been in Ohio, specifically Toledo. A strictly-local train wouldn't have the issues that are notorious for long routes. And while I love Bill's idea as well, the sticking point that I keep returning to in my own commuter rail dreams is the train station in Downtown Albany. There is simply no possibility of resurrecting this, as the former track and platform area is now filled by a parking garage and highway. It might come down to whether people are willing to use a connecting bus to the train station across the river - if a frequent circulator service was available, it could work. And local train would have to run fairly often, and one delay can cascade into big schedule problems.. I disagree with higher frequencies on such a line. This would work much better as a commuter line than a frequent light rail line. I have my doubts that ridership would justify a train more than once an hour. Even in the country's largest and densest cities, commuter rail runs much less frequently than regular transit, be it buses, light rail or subway. Going through sprawling suburban areas which are provided free highways, free parking (mostly) and cheap gas, frequent service wouldn't be justified. Fortunately, we're building out bus "rapid transit" for those who'll actually use it instead.